Charleston Wedding Photographers have a wide array of wedding venues to experience including Magnolia Plantation and Gardens, Woodlands Mansion, Carolina Girl Yacht, Middleton Place, Harbour Club, Belmond Charleston Place, Historic Rice Mill, and Woolfe Street Playhouse. Charleston is the oldest and second largest city in the state of South Carolina. The city is known for its rich history, well-preserved architecture, incredible restaurants, and mannerly local residents. Charleston is a popular tourist destination with a lot of character and has received a large number of accolades over the years. The colorful atmosphere of the city and its classic Southern charm make it a lovely destination for a wedding and a great location for Charleston Wedding Photographers. This image from a Charleston wedding venue focuses on the smaller details of a wedding that make it truly memorable. 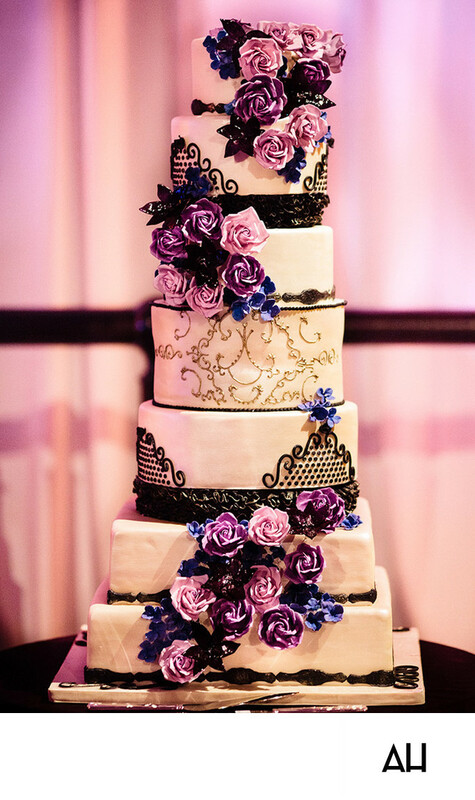 The wedding cake pictured is a work of art, and almost too beautiful to cut into and eat. The cake is made up of seven tiers: the bottom two tiers are square shaped and tiers above them round. The cake is covered in white, vanilla icing with intricate designs flowing over its surface. Dark chocolate details separate each tier. The fourth tier from the bottom, the center tier, is painted in delicate gold swirls that give the cake the appearance of being meant for royalty. Also covering the cake are frosting created flowers in varying shades of pink and purple. The result is an edible masterpiece, fitting with the elegant beauty that permeates the city of Charleston and this wedding day.